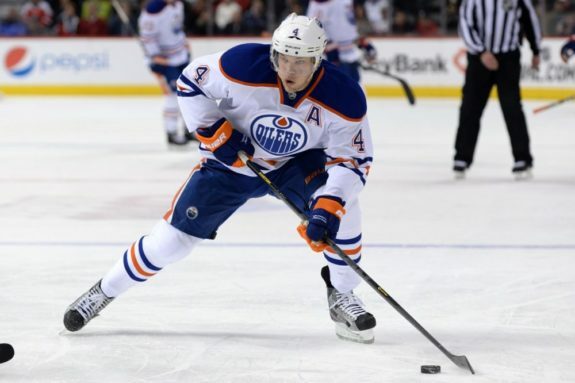 Could Taylor Hall Trade Work For Both Oilers-Ducks? Could A Taylor Hall Trade Work For Both Oilers And Ducks? The Oilers record against the West is almost unbelievable: 1-18-6. Their descent into the NHL’s dungeon has spurred a hail storm of rumors in Edmonton. Adding fuel to the fire, Darren Dreger went on TSN radio recently and hinted that, “Taylor Hall from a culture standpoint, not a on the ice standpoint hasn’t been what they thought he would be” (per @Hope_Smoke). That would be a terrible reason to trade a franchise-caliber player. Remember when the Bruins traded Tyler Seguin for those same reasons? So does the rest of the hockey world, and it’s not hard to imagine that they’d love to have Seguin in their lineup this season as they struggle to remain in the Eastern Conference playoff picture. Most importantly though, there’s very little chance that Edmonton makes this move in the foreseeable future. Oilers’ general manager Craig MacTavish has not indicated in any way that the franchise is ready to part ways with the first overall pick of the 2010. For the sake of conversation and general hockey nerd-dom, it’s worth at least exploring scenarios where such a trade would make sense for the Oilers, and also for the Anaheim Ducks, a team that possesses an incredible amount of organizational depth. There’s a notion around the league that Anaheim is stacked at forward, but too much of that hinges on the play of Corey Perry and Ryan Getzlaf. Ryan Kesler has provided a legitimate second line center for the first time since Andy McDonald bolted, but that was almost seven years ago. Filling out the top six wingers has been a challenge for coach Bruce Boudreau, especially faced with injuries to Perry and Kyle Palmieri. To boot, both Getzlaf and Perry are 29, and it’s reasonable to assume that there will be a decline in their games in the next three to four years. Emerson Etem, Matt Beleskey, and Devante Smith-Pelly have been short term patches for the Ducks’ lack of sure-fire top six wingers, yet there remains a lack of staying power with these three, adding to the notion that the Ducks don’t have an elite winger for the long haul. Hall is 23 and locked up through the 2018-19 season (per Capgeek) at a cap-friendly six million per year. He’s already nearly a point per game player and he hasn’t even entered the prime of his career yet. Speed, skill, and a vicious shot are the hall(ha! )marks of his game, and the thought of him lining up next to either Ryan Getzlaf or Ryan Kesler is mouth-watering from a Ducks perspective, who also have a good chunk of cap space. With Hall, Anaheim’s transition from the Getzlaf-Perry era would be a much smoother ride.The San Jose Sharks have benefited immensely from Logan Couture’s arrival, as he’s provided a bridge for their transition from the Joe Thornton-Patrick Marleau era. Hall could provide that same dimension that Couture has in San Jose. It would assure the the Ducks would have an exciting present and future. Without Hall, Edmonton would still have Ryan Nugent-Hopkins, Jordan Eberle, David Perron, Leon Draisaitl, and Nail Yakupov at their disposal. If even one of either Draisatl or Yakupov reaches their potential, their top six would be set long term. Simply put, they wouldn’t be hurting for offensive talent, especially if they end up snatching Connor McDavid or Jack Eichel in this year’s draft. What they really lack is above average goaltending and competent defense. Both of those are extremely difficult to acquire via trade in today’s NHL. Neither Viktor Fasth nor Ben Scrivens have been the answer in net, and the defense remains pedestrian. 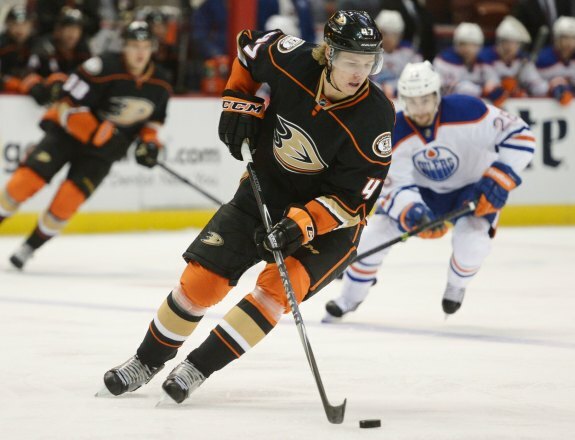 The Ducks have a bounty of talented young defensemen who are already solid NHL contributors, as well as a potential franchise goaltender in John Gibson. Frederik Andersen has proven that he can be a legitimate starter for Anaheim, so Gibson becomes an asset that could be parted with. Sami Vatanen could give a serious boost to Edmonton’s power play if he were to be involved in the deal, while Hampus Lindholm would be the Oiler’s best blueliner as soon as he would hit the ice at Rexall Place. The pieces are definitely in place for this hypothetical trade to work: the Ducks get their coveted future franchise player, while the Oilers shore up some serious weaknesses. On the whole, NHL general managers aren’t known for making trades where crucial pieces to both teams’ futures swap hands. So the idea that Craig MacTavish and Bob Murray could come to any sort of agreement with such important pieces at stake is pure folly. Although the Oilers have all that young talent up front, Taylor Hall remains the crown jewel of their draft bounty (though Nugent-Hopkins is making a strong case for that title). As for the Ducks, the risk would be too great to pull the trigger. Giving up any one of Cam Folwer, Sami Vatanen, or Hampus Lindholm is a serious gamble given each player’s immense importance. Throw John Gibson in the mix, who may very well be better than Andersen when it’s all said and done, and the trade dies a very quick death. Though it’ll never happen, the very thought that there is some plausibility, at least on paper, speaks to the incredible organizational depth that the Ducks have amassed.